Reggie Keely has helped to bring a renewed intensity to egoé Basket Brno. Photo credit: Jan Russnák. Brno, Dec. 12 (BD) — HC Kometa eliminated from Champions League, Žabiny Brno host UBI Graz tonight in CEWL play and the Brno sports schedule. Though they have few successes, egoé Basket Brno continues to play an exciting brand of basketball that is showing signs of soon paying off with victories. The team plays a Kooperativa NBL game tonight (Wednesday) when it hosts Moravian rival Olomoucko at 8 p.m. If you are looking for something to do on a cold midweek evening, you could do a lot worse than the excitement of a men’s basketball game. Home games are at the modern court at universitni kampus Bohunice. Click here for directions. 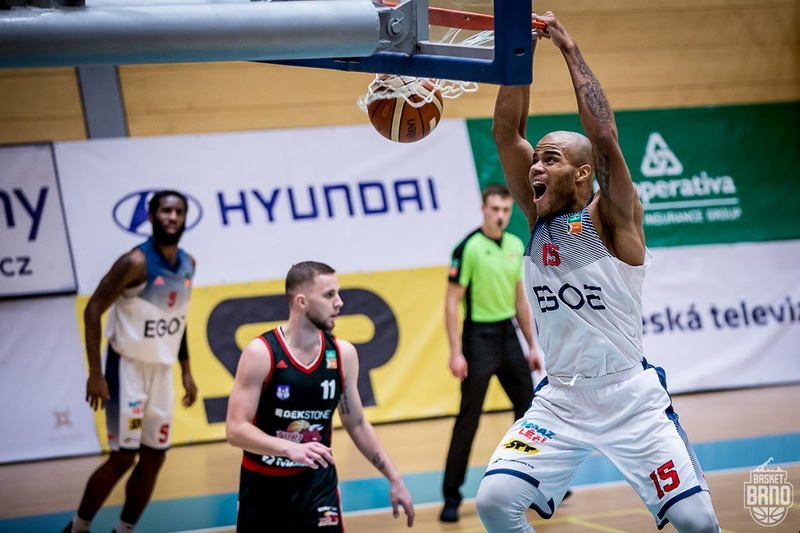 egoé Basket Brno (3-9) has yet to really break, although the team beat its next three opponents — Olomoucko at home tonight, at NH Ostrava on Saturday and at BK Armex Decin next Wednesday — earlier in the season. On Sunday, Brno led Dekstone Tuři Svitavy through the first half and, after losing the lead during a third-quarter “dead period”, almost regained control of the game, before falling, 73-83. Brno was within 3 points with two minutes left a looked to be picking up momentum. It was Brno’s eighth straight loss in the league. Svitavy (8-4) won its fourth game in a row and is now second in the league behind undefeated ČEZ Basketball Nymburk (12-0). Brno’s Davell Roby was a presence on both ends of the court, scoring 19 points and stealing the ball four times. Deremy Gieger led the team with 21 points, including 14 after halftime. HC Kometa finished their participation in the Champions League when they lost, 6-1, at the Frölunda Indians on Tuesday night. The lone highlight from Tuesday’s game in Sweden was the first Kometa goal for 16-year-old Erik Meluzín. Including their 1-4 loss at home last week, Kometa were eliminated from the Champions League Quarterfinals by an aggregate score of 10-2. Brno finished in the quarterfinals last year as well. In Tipsport extraliga play, Brno is in fifth place with 42 points, 13 behind league-leading Třinec. Last Thursday, with rival Sparta in town, HC Kometa brought out their big guns: Martin Erat and Tomas Plekanec. Both players had long and successful NHL careers and both have served as captains of the Czech national team. And, both teamed up to produce the first goal: Erat passed to Plekanec. Pleckanec passed to Karel Plášek. And Plášek, an 18-year-old, scored. Plekanec later scored a goal, but in the end, Sparta came out on top, 3-4, when it scored a minute into extra time. Kometa won in Zlin, 1-4, on Sunday. Martin Dočekal had two goals, the first of his season. League play takes a rest before a slew of games during the holiday season. 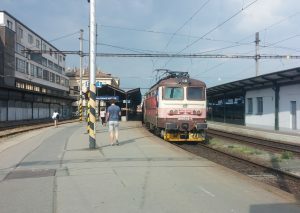 Brno will next travel to Chomutov on Dec. 18. Then they play Plzeň on Dec. 21 at home; at Olomouc on Dec. 26; Ml. Boleslav on Dec. 28 at home; and at Pardubice on Dec. 30. Žabiny Brno won three CEWL games last week. They beat host UBI Graz, 51-84, on Dec. 4. Then, in a tournament in Piešťany, Slovakia, they beat Amsterdam Angels, 82-58, on Saturday and Dynamo Moskva, 49-80, on Sunday. They host UBI Graz tonight (Wednesday) at 6 p.m. On Saturday, Žabiny Brno (7-3 in the ZBL) will finish the calendar year in the league when they host Ostrava at 5 p.m.
Teamstore Brno (1-9) travelled to U19 Chance (1-9) on Sunday and lost, 77-69. Brno was down 24-12 after the first quarter. They scored 22 points in the third and fourth quarters, but it was not enough. Karolína Jandová missed just one shot — 4-for-5 from 2-point range, 1-for-1 from 3-point range and 6-for-6 at the freethrow line — as she led Teamsport with 17 points. Tereza Zítková added 15. KP Brno lost its first game under new coach Martin Pospíšil at Reyer Venezia, 76-53. They play tonight (Wednesday) at Nantes Reze. U19 Chance. Pospíšil’s first home game will be against DSK Basketball Nymburk on Jan. 5 at 3:30 p.m.
— Women’s Basketball, CEWL: Basket Žabiny Brno X UBI Graz, 6 p.m.
— Men’s Basketball: Basket Brno X Olomoucko, 8 p.m.
— Women’s Basketball, Eurocup, Group G: Nantes Reze X KP Brno, 8:30 p.m.
— Women’s Basketball: Žabiny Brno X SBŠ Ostrava, 5 p.m.
— Men’s Basketball: NH Ostrava X egoé Basket Brno, 5:30 p.m.
— Women’s Basketball: DSK Basketball Nymburk X Teamstore Brno, 2 p.m.
— Women’s Basketball: U19 Chance X KP Brno, 5 p.m.
— Hockey: Chomutov X Kometa, 5:30 p.m.